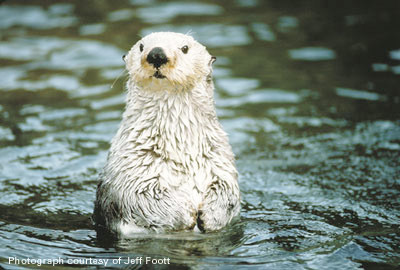 The Otter Project’s Executive Director and Founder captures hearts and minds with a picture we call ‘upright otter’. Palpable ‘oooohs’ and ‘aaaahs’ could be heard throughout the room. Late yesterday (11/14) the California Coastal Commission denied PG&E’s application to conduct high-energy seismic testing within Estero Bay and in the heart of the sea otter’s range. PG&E said the testing was needed to assess the potential magnitude of an earthquake at PG&E’s Diablo Canyon Nuclear Power Plant. Studies indicated that 62 otters or more could have been harmed or killed by the tests in addition to harbor porpoise, dolphins, whales, fishes and more. The nexus between nuclear safety and the environment required thoughtful consideration and study by all stakeholders. Should sea otters stand (paddle!) in the way of public safety? The Otter Project was part of a small group of environmental activists that also included the Sierra Club, NRDC, Surfrider, and Coastal Advocates. The small but powerful environmental caucus was supported by a myriad of other groups and by literally hundreds of activists rallied by Surfrider, Ocean Conservancy, Greenpeace, and the Chumash Tribe. The environmental perspective was 1) nuclear safety is critically important and we need to know if the plant is safe; 2) alternative and less destructive technologies are available to gather the same information; 3) PG&E has not analyzed the low energy data they have already acquired to determine if the high-energy data is even needed and; 4) PG&E has stated that no matter what the result, they believe the plant is adequately constructed and will make no changes. After eight hours of testimony and deliberation the California Coastal Commission voted unanimously to not allow the tests to move forward. The tests would have cost PG&E ratepayers $64 million. With PG&E stating that they would not make any changes no matter what the tests showed, it is clear we are just as safe and further ahead with 62 sea otters left alive and paddling. Follow the public reaction to the news on our facebook page. Yes, you read that right. Climate Change. Last week, I read about a new study by two UC Santa Cruz researchers that suggests that sea otters undoubtedly influence the carbon cycle, CO2 storage, by limiting sea urchin populations which allows kelp forests to thrive. The paper was published online in Frontiers in Ecology and the Environment by lead authors UC Santa Cruz professors Chris Wilmers and James Estes. The results of the study indicate that kelp absorbs as much as 12 times the amount of CO2 from the atmosphere with a thriving sea otter population. The UCSC researchers and their co-authors combined 40 years of data on otters and kelp bloom from Vancouver Island to the western edge of Alaska’s Aleutian Islands. By comparing kelp density with otters and kelp density without otters, they found that sea otters have a positive indirect effect on kelp biomass by keeping sea urchin populations in check. Without sea otters, sea urchin populations explode and decimate large areas of kelp beds resulting in urchin barrens. Even though kelp is particularly efficient at sequestering CO2 from the atmosphere, scientists have assumed that kelp forests weren’t a significant factor in reduction of the amount of carbon in the atmosphere. They were surprised to discover that the effect of sea otter’s maintaining healthy kelp forests represents a 4.4- to 8.7 megaton increase in carbon storage. The economic value of the stored carbon on the European Carbon Exchange in 2012 prices is estimated to be between $205 to $408 million US dollars. 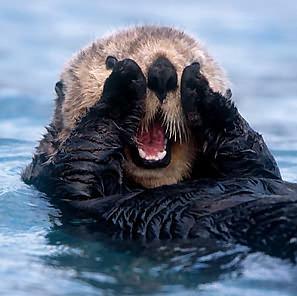 Given the global scale of climate change, Jeffrey Dukes of the Purdue Climate Change research Center stated that the impact of sea otters is “relatively inconsequential in terms of the big picture of climate change, [but it’s] an interesting study identifying how dramatically a predator can alter the cycling of carbon in an ecosystem” (National Geographic News, Kate Andries). The researchers acknowledge that otters only play a minor role but their study illustrates that animals worldwide can influence the carbon cycle and might actually have a large impact on reduction of CO2 in the atmosphere. It is well known that sea otters play a significant role in the nearshore marine ecosystem. As a keystone species[i] they maintain local biodiversity by controlling populations of other species, such as sea urchins, that would otherwise dominate and alter the nearshore environment. 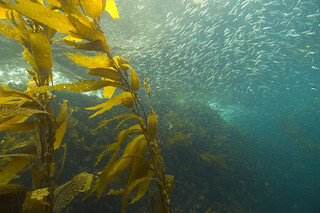 A giant kelp forest is an ecosystem unto itself hosting invertebrates, fish, marine mammals, and birds from their holdfasts to the surface mats of kelp fronds. 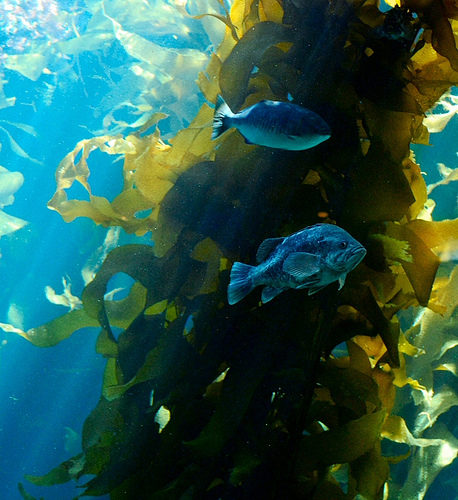 The array of habitats on the kelp itself may support thousands of invertebrate individuals, including polychaetes, amphipods, decapods, and ophiuroids and provides nurseries for fish and other species (NOAA National Marine Sanctuaries). The results of this study broadly shows how important maintaining ecological/ecosystem balance at the local level is to the global ecosystem we live in. Everything is connected. Increased protection for sea otters results in increasing kelp biomass and productivity, a healthier nearshore ecosystem, and a positive impact on our atmosphere and our planet. [i] A keystone species is one whose impacts on its community or ecosystem are large and greater than would be expected from its relative abundance or total biomass. Monterey, CA –The U.S. Geological Survey’s Western Ecological Research Center (USGS-WERC) released their annual sea otter survey count for 2012 this week and the news is good. The results were presented with cautious optimism since “the southern sea otter population continues its pattern of tepid recovery.”  If you read the Spring 2012 Mainland California Sea Otter Census Results summary you get a detailed account of the sea otter population survey and the devil is in the details, as they say. All of the numbers are up across the board. The 3-year average of sea otters increased 1.5% to 2792, up from 2711 in 2010. The total raw sea otter count was 2865 which is an increase of 5.1% from the 2010 spring survey which only counted 2719. The pup count is also up from 267 in 2010 to 379 in 2012, which is the third highest pup count on record. There were more pups counted (relative to the previous census) in 10 coastal segments and 10 pups were seen southeast of Pt. Conception, which is the highest pup count on record and only the second time pups have been observed in this area during the spring census. There were also a total of 79 sea otters (including the 10 pups) counted southeast of Point Conception – 26 more than in spring 2010. This is great news considering the population experienced back to back years of record sea otter deaths in 2010 and 2011 and there was no survey data for 2011 to let us know how the population was faring due to poor weather conditions. We cannot rely on just one year’s worth of data to tell us how the sea otter population is doing because there is year-to-year environmental variability and other external factors that impact the population. The ocean is a very dynamic system and we have to factor the variation into the equation. Even though these results are only for one year, they are still encouraging given the challenges sea otters continue to endure. The Otter Project believes that it is important to keep the big picture in mind when it comes to the recovery status of the California sea otter population but we also believe we should celebrate when there is some good news about how the population is doing today. If you would like to learn more about California sea otters or how you can help, please visit our website at www.otterproject.org. You can also become a member or help us continue our work with a much appreciated donation by clicking www.otterproject.org/donate-now/. The USGS uses the spring survey count to determine the 3-year running average (population index), which is the metric the US Fish and Wildlife Service uses to assess the current status of the population. MONTEREY, CA – On July 4th, 2012, a milestone of 2000 surveys monitoring California’s Marine Protected Areas (MPA) was reached by volunteers with The Otter Project’s Central Coast MPA Watch program. Starting in March 2011, MPA Watch was launched in San Luis Obispo, Monterey and Santa Cruz to monitor for compliance with MPA regulations and help enforcement agencies and scientists understand the ways in which people are using the coastline inside MPAs and adjacent areas. “Considering the program has been running for only 15 months, it is a remarkable achievement to have gathered so much data in such a short period of time,” said Brad Hunt, Program Manager of The Otter Project’s MPA Watch Program. Following a pilot program in 2010, volunteers began surveying at strategic sites along the coast, observing a range of activities from regular beach goers and divers to surfers and commercial fishing boats close to shore. “This is easily the most successful program of its kind in the state and plays a vital role in helping to promote ocean stewardship among Central Coast residents at a time when resources are scarce and funding is tight,” said Hunt. The data collected by volunteers is compiled and made available to the public via The Otter Project’s website in the form of maps and reports indicating usage patterns at key locations. It is anticipated that this data will help the Department of Fish and Game’s enforcement efforts in the region by identifying potential hotspots of human activity. “We’re in talks right now with a number of different ocean groups about their own MPA Watch programs and sharing our expertise and lessons learned during the last year. Looking forward we would love to see it grow to include areas along the California coast north of Point Reyes,” said Hunt. Residents looking to participate in the MPA Watch program can contact Mark Welden-Smith on 831-646-8837 x116 or visit www.otterproject.org for more details. Huntington Beach, CA—By unanimous vote, the California Coastal Commission yesterday confirmed that the U.S. Fish and Wildlife Service’s (FWS) proposal to terminate the failed southern sea otter translocation program is consistent with the coastal protection policies of California’s Coastal Act. The Commission’s decision represents an important milestone in the effort to finally repeal the “no-otter” zone–an outdated rule from 1987 prohibiting threatened southern sea otters from California waters south of Point Conception (Santa Barbara County). Allowing otters to once again inhabit southern California waters is considered critical to the recovery of the species under the Endangered Species Act, but the decision to declare the translocation program a failure has been delayed by more than two decades. 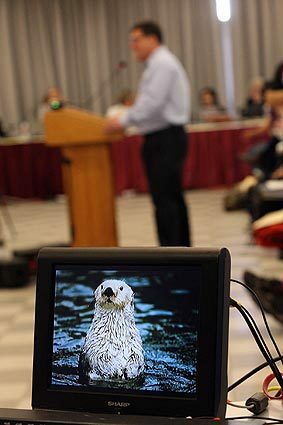 Under a 2010 legal settlement reached by The Otter Project and the Environmental Defense Center (EDC) with FWS, the agency must make a final decision on the translocation program and the fate of the “no-otter” zone by December 2012. “The Commission’s decision brings us one step closer to having southern sea otters fully protected throughout California and freely swimming in Southern California waters. This is a crucial outcome supporting recovery of one of California’s most charismatic marine species,” said Steve Shimek, Chief Executive and Founder of The Otter Project. The Commission’s decision to concur with FWS’ “consistency determination” was required by the federal Coastal Zone Management Act, which mandates that federal actions affecting a state’s coastal zone must be consistent with that state’s coastal protection policies. In California, these policies are embodied in the California Coastal Act. In reaching its decision, the Commission rejected arguments made by the California Sea Urchin Commission and other shellfish industry groups that it delay making its decision. Several Commissioners noted that it has long been clear that the translocation program has failed and continuing the program will continue to hinder recovery of the population. Moving sea otters out of the current “no otter” zone resulted in harm and even mortality. As sea otters have begun to slowly move into southern California waters, it is important that they be fully protected. Shellfish groups have, however, successfully lobbied to include a provision in the House National Defense Authorization Act for Fiscal Year 2013 providing them with exemptions to “take” (kill, harm, or harass) southern sea otters that would otherwise be illegal under the federal Endangered Species Act and Marine Mammal Protection Act. The Otter Project and EDC are working to remove this provision, which would provide special treatment for all fishing groups in Southern California and has no place in a bill explicitly for national defense and support of our nation’s armed forces. It’s easy to forget that meaningful change often happens in increments. Sometimes years go by until it becomes apparent that a fundamental change has occurred. On the eve of World Oceans Day, The Otter Project would like to recognize one such meaningful change—California’s network of Marine Protected Areas (MPA). In January 2013, another piece of the statewide MPA network will fall into place with the North Coast region of MPAs coming online to protect a further 1,027 square miles of California coast. From the Mexico border to the Oregon state line, California has set a nationwide precedent in creating a linked network of MPAs that are assisting in the rehabilitation of depleted fish stocks and aiding the restoration of its marine ecology. It has been a hard fought road from the inception of the Marine Life Protection Act in 1999 through to the current network of MPAs, with opposition from special interest groups, funding issues and lack of political will being major obstacles. From the beginning, The Otter Project has supported the development of these networks, taking an active role not only in their creation, but in helping to monitor their usage through our MPA Watch volunteer program in the Central Coast region. With the ongoing challenges that ocean conversation groups face on a daily basis, World Oceans Day seems to be an appropriate time to reflect on the significance of this achievement. Piece by piece, region by region, MPAs have been instituted through the combined effort of scientists, politicians, advocates and concerned ocean stewards. As it did with Yosemite Valley way back in 1864, California is again demonstrating its commitment to being a guiding light for the protection of our natural heritage for future generations. On May 17th, Rep. Gallegly made a floor statement for his amendment, formerly House Bill HR 4043, to the 2013 House National Defense Authorization Act (NDAA) to establish “Military Readiness Areas” and provide unprecedented protections for all commercial fishery interests in Southern California. Unfortunately, Rep. Gallegly’s amendment was accepted and added to the Bill. Although the original language requiring an ecosystem management plan, assessment of carrying capacity for sea otters, and continuation of the translocation program and the “no-otter” management zone is not in the amendment, commercial shellfish fisheries exemptions for “incidental take” of sea otters is included. “Incidental Take” means the accidental capture, or death, of a sea otter during the course of an otherwise lawful act (e.g. military training, commercial fishing). We were originally opposed to the entire Bill, when introduced, but compromised on the military exemptions for “incidental take.” In other words, the military can accidentally kill an otter in the course of their training exercises and that would be acceptable within the realm of National Defense. Unfortunately, shellfish fisheries think that they deserve the same exemption. The problem with fisheries having this exemption is that sea otters are natural competitors with shellfish fisheries. If a fisherman runs over a sea otter in their boat or “catches” an otter in a net or “by accident” then this will not be considered as a violation under the Endangered Species Act (ESA) or the Marine Mammal Protection Act (MMPA). Now with the new amendment in the NDAA, southern sea otters will not regain protection under ESA and MMPA in Southern California with respect to all fisheries in Southern California even when the US Fish and Wildlife Service make their final decision to end the translocation program and management zone in December 2012. The National Defense Authorization Act passed the House last Friday, May 18, 2012, with Rep. Gallegly’s amendment included. The Senate will now pass their version of the National Defense Bill. The two bills will then go before another committee to reconcile the differences in language before it goes to the President. If the NDAA passes through this committee with the fisheries exemptions included, this will set an unfortunate precedent for the protection of the threatened southern sea otter and other threatened or endangered species. If a single special interest group can get an exemption for a particular species, what is to stop other special interest groups from seeking legislative protections hidden in other Congressional Bills?